Tonight, you should be able to see the International Space Station make one of its overflights of Charlestown. The National Weather Service says our mostly sunny, smoggy day will transition into a mostly night. The ISS will appear in the north-northwest at 8:34 PM sharp at an angle of 26 degrees over the horizon. It will travel across the sky up to a high of 44 degrees elevation, about half up the sky. Then it will cruise along for four minutes heading toward the east southeast where it will seem to vanish at about 11 degrees above the horizon. 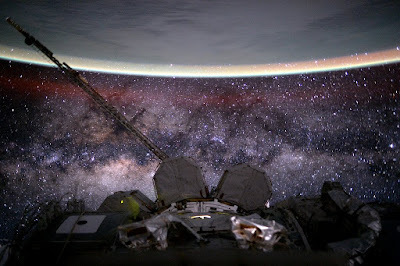 The Space Station, like all other visible man-made satellites, is only visible when reflected sunlight hits it just the right way. Because the ISS is in a low earth orbit, its sighting always happen pretty close to sunset or sunrise. You can sometimes see much higher satellites at any time of night, but they are much harder to spot than the ISS since they are much smaller and further away. There are the Iridium communications satellites that are generally only visible as a brief flash. I've only seen one that I could positively identify as an Iridium satellite - they resemble a meteor fireball, but with a very different motion. You can sign up with NASA's "Spot the Station" listserve and get a warning e-mail before such overflights. Click here to sign up for the alerts. With binoculars, you should be able to see some detail on the station, but I also enjoy watching it with the naked eye.